Some called them the famous squat sisters, I prefer to call them the Humble Sisters because they are indeed modest and unpretentious, not cocky and fun to talk to. 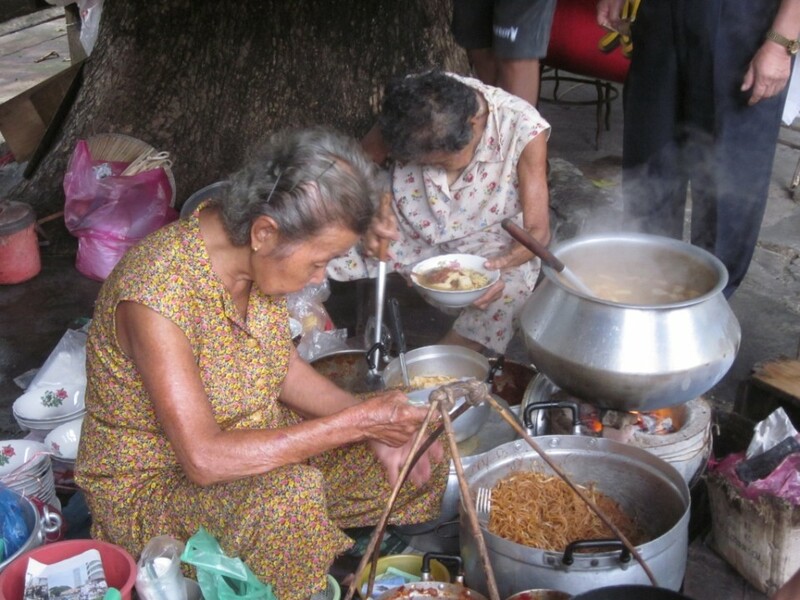 Lim Kooi Heang and Lim Kooi lai are way past their 80s, have been selling curry mee for about 70 years. One of them seems to be suffering from arthritis. They start their biz at 8.00 am and close at 1300 pm. I had a plate of their economical beehoon/mee served with their signature sambal and 2 bowls of their curry mee laden with pig blood puddings, tofu puff, bean sprout, extra cuttle fish and sambal during my 5000 calories food marathon (just for breakfast that morning). I prefer the gravy of the curry mee more than any other places I’ve eaten because it is not so lemak. They told me with a big smile their secret is to cook the sambal every evening for a long time. Despite of their physical condition, they are the most cheerful hawker I have come across. They chatted with everyone regardless local or tourist happily, without any air of snobbiness even though they are so famous. 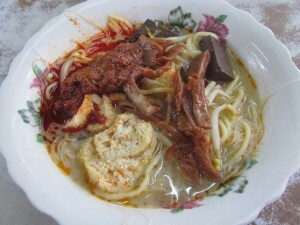 I definately will go there every trip I visit Penang to have my double curry mee. Just in case you cannot find the place, just ask anyone around Air Itam, they will be happy to direct you to the stall.